The Diabetics’ 1500 Calorie Diet Plan. No matter what you have, be it pre-diabetic, type 1 or type 2 diabetes, sticking strictly to a diet which prevents the intake of excessive carbohydrates, sugar and calories is necessary. Since the amount of calories required by you depends on many factors, you need the assistance of a nutritionist or dietitian and your medical practitioner to find out the maximum amount of calories required by you each day. For most diabetics, the usual amount needed is 1,500 calories. 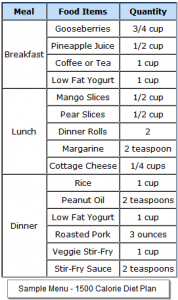 Information to assist in the making of food plans as well as exchanges which are useful in the creation of a daily diet for 1,500 calories are given by the ADA (American Diabetes Association). About 50 % of your daily diet ought to consist of carbohydrates and sugars, although between 40 – 60 % is still acceptable. However, the amount of carbohydrates in each meal ought not to exceed 45 – 60 grams. It is even better if they are complex carbohydrates like fruits and vegetables and not simple carbohydrates like sugar and bread. The remaining calories come from lean protein, between 15 – 20 % and fat which can be between 20 – 35 %. Fiber intake each day should be between 25 – 30 grams. In order to calculate the amount of carbohydrates and sugar in each meal as well as the total for each day, you have to know how much of them exist in the many types of food you eat. For free assistance, go to the ADA’s (American Diabetes Association) MyFoodAdvisor by clicking on ”nutrition” after you have gone into www.diabetes.org. As far as possible, your meals ought to be planned in advance. To be able to control blood glucose levels, consume the same quantity of food at every meal and the times for the meals must be the same every day. Your meals should comprise of the three main meals of breakfast, lunch and dinner as well as two snacks. Do not skip any of the meals. 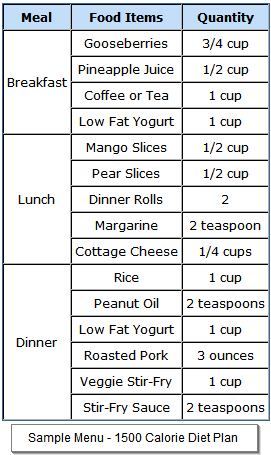 Using either the “plate method” or the exchange lists is the simplest way to start your planned diet. In the exchange list, foods are put under a number of categories such as fats, meats, sweets, “free” foods, non-starchy vegetables, dairy, fruits and starches. For each meal in a day, you are given a number from each of the exchange group you are allowed to have by your dietitian. With the number of the exchange category or list, you choose one of the items for the specific meal from the category in the exchange lists. For instance, two starch exchanges will give you either half a baked potato which is large or two flour tortillas. Then, you go on to other categories in the exchange lists, choosing the food in the categories according to the food plan. “Free” foods like salad greens, hot pepper sauce, mustard, diet soda and bouillon can be enjoyed as frequently as you wish. For these lists, you can go to the Mayo Clinic Food Exchanges or the ADA site. You need not count calories or use any particular tools such as exchanges when you use the “plate method” What you need to do is to concentrate on how you are going to fill your plate using non-starchy vegetables, starches and meats. First, draw an imaginary line to divide your plate into two halves. Then, divide one of the halves into two equal sections. This will give your plate three sections to be filled with food. In the largest section, put all the non-starchy foods such as spinach, green beans and broccoli. Then, fill one of the small sections with a starchy food which can be black beans or brown rice. Fill the remaining small section with lean protein which can be cottage cheese, egg, chicken or tuna. Give yourself a piece of fruit or half a cup of sugarless frozen or canned fruit and a 6-ounce yogurt or an 8-ounce cup of low-fat or non-fat milk. Together with two snacks, that will be about 1,500 calories for one day. For a fee of about $100 a year, you can get menus, a week’s supply each time from many websites which are ready with diabetes meal plans. One such website is 1500caloriemenus.com.